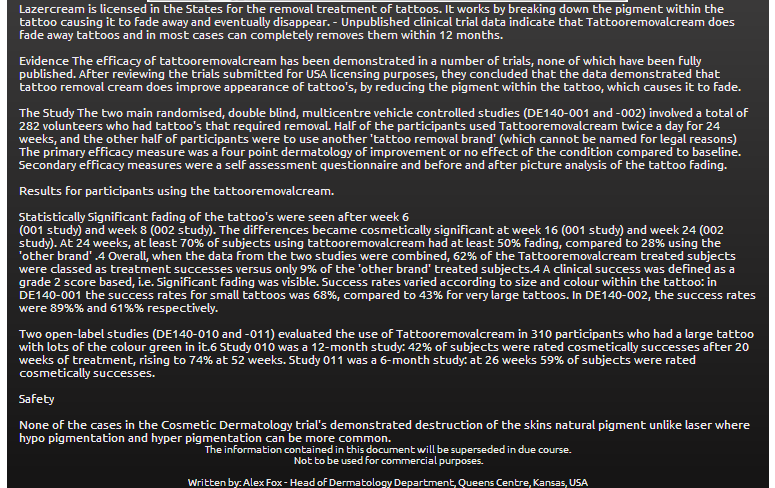 Sciblogs | Is there such a thing as tattoo removal cream, or is it a scam? Is there such a thing as tattoo removal cream, or is it a scam? 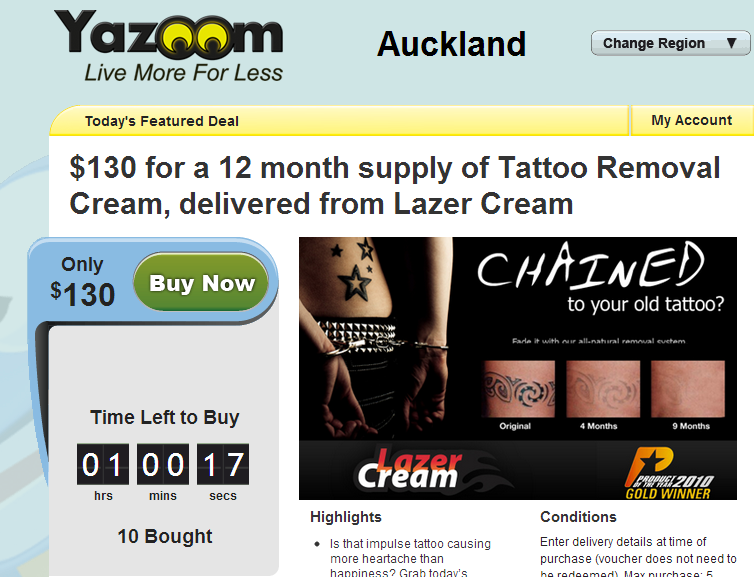 A couple of weeks ago I saw an offer on the online deal site Yazoom for a 12 month supply of tattoo removal cream (Lazer Cream) for $130. While there is the usual ‘*Results may vary’ disclaimer, the photos look pretty impressive. While I don’t actually have any tattoos, the only method for removing them I have ever heard of involves lasers* so I was curious. Now what follows is a rather lengthy and twisty tale but bear with me. On visiting the company’s (what looked like Australian) website, I found a section where they listed the cream’s ingredients. The main ‘fading’ ingredient was listed as ‘Zyalight’. Riiiight. What’s that then, I wondered? Googling it sent me to a press release from 2000 about “a major breakthrough in skin lightening technology… development of Zyalight, a completely natural lightening ingredient” by a company called Zylepsis, which it turns out went under in 2003. So a dead end. I also saw a section called ‘Study’ where they described the results of unpublished clinical trials on their product. Below is a screenshot of that section. It’s worth having a quick skim read through. The efficacy of eflornithine has been demonstrated in a number of trials, none of which have been fully published….After reviewing the trials submitted for licensing purposes, the EMEA concluded that the data demonstrated that eflornithine cream improves symptoms of hirsutism, reduces darkening appearance of facial skin, and reduces psychological discomfort with the condition. The two main randomised, double blind, multicentre vehicle controlled studies (DE140-001 and –002) involved a total of 596 women who had facial hirsutism that required removal at least twice a week. The subjects applied (in a ratio of 2:1) either eflornithine 15% or a vehicle-cream twice a day for 24 weeks, and were followed for 8 weeks when they received no treatment. The primary efficacy measure was a four point Physicians Global Assessment (PGA) of improvement or worsening of the condition compared to baseline. Secondary efficacy measures were a self assessment questionnaire and video analysis of reduction in hair growth and spatial mass. Statistically significant improvements in facial hair growth were seen after week 4 (001 study) and week 8 (002 study) in favour of eflornithine based on PGA. The differences became clinically significant at week 16 (001 study) and week 24 (002 study). At 24 weeks, at least 70% of subjects using eflornithine had at least some improvements in their condition, compared to 41% using the vehicle…. Two open-label studies (DE140-010 and –011) evaluated the use of eflornithine in 970 women who removed hair at least twice a week from their upper lip and chin.6 Study 010 was a 12-month study: 18% of subjects were rated clinical successes after 20 weeks of treatment, rising to 24%. Now that sounds familiar. Almost cut and paste familiar. At first i just wondered if the trial quoted for the tattoo removal cream was a sub trial of the eflornithine trial – perhaps some tattooed women were part of the original trial and noticed their tattoos fading during the trial. But I can’t find any mention of tattoo fading in any of the leaflets for eflornithine/Vaniqa and I’m sure it would be listed as a potential side effect if it was a possibility. So is it all a scam? Is there no such thing as a cream that can remove tattoos? I went to PubMed to search for any academic publications and actually did find something. A drug called imiquimod. Imiquimod is approved for treating certain skin cancers and genital warts, but it looks like it also being tested in conjunction with laser treatment for tattoo removal. It’s not yet clear exactly how imiquimod works, except that it activates the immune system, and some pretty nasty side effects have been reported, including itching, irritation, pain, ulcerations, weeping sores, flaking skin and scabbing as well as fatigue, nausea and fever. In the meantime though, Lazer Creams original website (tattooremovalcream.com.au) is now redirecting to a single page site which, while still about Lazer Cream, has no contact info. Looks like someone is on to them! According to Yazoom’s site, 21 people paid the $130 for their years supply of cream. I’d be interested to know how they get on. *Well, unless you count the people who resort to using trichloroacetic acid. **As an interesting aside, according to wikipedia, eflornithine was initially developed to treat cancer but instead was found to be very effective at reducing hair growth (when given topically as a cream), as well as killing the parasites that cause West African sleeping sickness, Trypanosoma brucei gambiense (when given intravenously). The drug was registered for the treatment of gambiense sleeping sickness in November 1990 but Aventis stopped producing the drug in 1995 because it wasn’t profitable. It wasn’t until 2001, when eflornathine began to be marketed for hirsutism, that Aventis bowed to international pressure and formed a partnership with the WHO to begin producing the intravenous form again to treat sleeping sickness. Can an add be shut down because of plagiarism? In the late 80s while working on my PhD using lasers to remove Port Wine Stains we made some attempts to remove Tattoos. If I recall correctly (huge disclaimer) the pigments were very small (issues, therefore, in getting them to absorb the energy) and they were coated by collagen, I think, which prevented the macrophages from coming and gobbling them up. Removal required the development of lasers with nice ultra-short pulses to “shatter” the pigments. As for a cream doing the job…I doubt it. The cream would have to get through the outer layers of the skin (not easily done – most moisturisers fail at this), locate the pigment and then undergo some kind of chemical reaction to break it down. I bought this cream (4 x tubes for $99) about a month ago but from a different website, the thing that convinced me into buying it was that it claimed to have been advertised / shown on Dragons Den, CNN covered a story on it, I guess I just got sucked in by the ease and affordability of getting rid of embarrassing tattoos I had done 20 yrs ago, needless to say I have been applying twice daily for the past month with no noticeable difference yet, I’m not holding my breath, but will continue to use it . Thanks for your research and post, it was very interesting. Hi Lynne, Have you been taking photos? Do let me know how you get on. I have been using it for 2 months now morning and night everyday and cannot see any difference. I have taken photos also and compared and not even the slightest fading. I have also paid for cream so will continue to use as have nothing else left to lose. My tattoo is small about an inch in length and width. the website advise that a 3 month supply should do but I went for 6 just in case. If I were you I wouldn’t waste my money. The problem with creams is that they don’t penetrate deep enough. There is a layer of the skin called the epidermis (which is the top layer) and then there is the dermis (this is where the tattoo pigment is injected). The cream just bleaches the epidermis and makes the tattoo seem faded. For a complete removal of the tattoo either use laser or excision (if it is small and you are prepared to pay a lot). You can check out this article http://www.ncbi.nlm.nih.gov/pmc/articles/PMC2884836/ on information on lasers and you are welcome to browse http://www.tattooremovalmanchester.org for more information on the different tattoo removal methods etc. Thanks for your well researched work , I received this from my godson in Auckland and have just received some DERMABLEND (Caramel) from a friend in Australia for my daughter who has to cover her tattoo as she is a semi finalist in beauty pageant. She is happy with the DERMABLEND and has had here first session of laser treatment in order to have the TATTOO removed. How many vulnerable people will take heart from these dangerous adds and view tattoos as temporary? Rather than remove unwanted ink, products such as this will cause a further proliferation of tattoos as reasonably priced removal creams take away the concerns of those who baulk at life long markings. So, I have tried to remove an old tattoo of mine through pretty much every tattoo removal cream sold in the UK. I have been using a combination of these for over 2 years, and it is safe to say that the changes have been minimal. I think laser tattoo removal is the only (painful) way to go…. I was investigating methods of tattoo removal for my youngest son and came across an ad for this ‘tattoo removal cream . . .as seen on dragons den’ but I was not convinced so decided to look into it further. After reading a few items I came across your post after perusing said post I need look no further so firstly I applaud you for a job well done and secondly a massive thank you for saving me a lot of time and effort. My son has autism and became obsessed with tattoos in his late teens and announced that he was going to get one. I desperately pleaded with him to wait a few years before making such a drastic decision but as any parent of an autistic teenager will know that once they make a decision to do something nothing will get in their way! I’m so pleased you found this useful and thanks so much for letting me know. Thank you for the very informative article. So, I have tried to remove an old tattoo of mine through pretty much every tattoo removal cream sold. I have been using a combination of these for over Last one year, and it is safe to say that the changes have been minimal. I think laser tattoo removal is the only way to go. Thank you for the very informative article. I just did a tattoo removal a couple of days ago. I have to say it hurts less than expected. They told me it will hurt like the tattoo is being applied, but that’s a lie. And tattoo removal creams take to much of time and have minimal effect.